There’s no shortage of Markdown editors to choose from, and many of them are fantastic. We think Byword is the best of the bunch because it hits the sweet spot between simplicity and functionality. Byword offers a calm writing environment, yet has enough features under the hood enough to make you a happier and more productive writer. If you’ve made the choice to read an article about Markdown editors, I’m guessing you have at least some familiarity with Markdown. If you don’t, you’ll be lost reading the rest of this article without at least some general understanding. Markdown, in the most simple definition, is a text-to-HTML conversion tool. Markdown allows you to write in a more simplistic syntax with the thought that it will eventually be translated to HTML. Of course, this conversion requires some intervention. 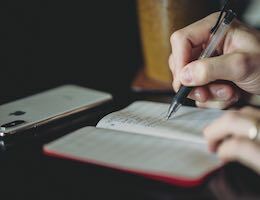 It’s possible to run some command line tools to help you parse your Markdown, but the easier track these days is to use one of the many, many applications available to write your Markdown. 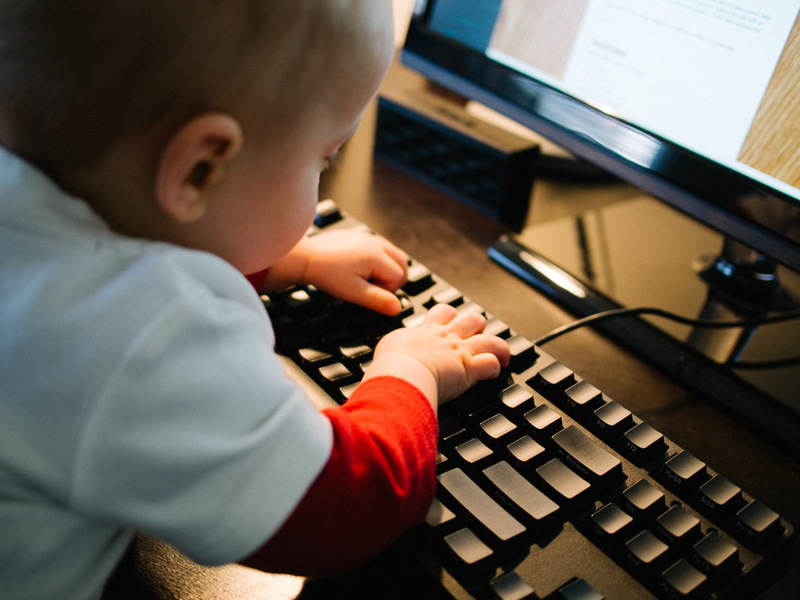 That’s what we’re discussing in this article — our favorite Markdown writing application. Originally created by John Gruber, the Markdown syntax has nearly become the standard for writers on the web, and because the format is simply a text file, you’ll see its usage all over the place these days. The idea behind Markdown is that your files don’t need to be connected to some specific application (i.e. Word or Pages documents). With Markdown, you can write in a format that will still hold some semantic meaning whether or not you’re parsing it. A text file written in Markdown syntax is still very easy to read, and by removing the requirement of any specific technology, you’re left with one of the most portable file formats: text files. For a more thorough explanation combined with examples, the Markdown documentation is a great resource for beginners and regular users alike. Make writing with Markdown syntax easy. Show a preview of rendered Markdown. Export production-ready HTML from a Markdown document. Writing in Markdown is not an overly complicated task, but we can all use a hand regardless of our familiarity with the language. Syntax highlighting can go a long way in finding errors and making it easier to learn Markdown. An application that highlights the Markdown components of your writing helps to validate, in real-time, that you’ve written it correctly. One of the benefits of Markdown is that you don’t have to clutter your document with HTML tags. Since Markdown takes care of the conversion, if you can’t view the final product without another application, then we’d argue you’re not using a true Markdown editor. It’s a small, but important feature, so our editor needs to have this functionality built in. There are some applications that are built for the specific purpose of rendering Markdown, but we feel like that adds an unnecessary layer of complexity to a fairly simple task. Some folks prefer the flexibility that one of these dedicated Markdown rendering apps can allow, but we feel that the single app solution makes more sense for most people. That said, we’ll check out a great Markdown preview app a little later on if that’s more of your thing. 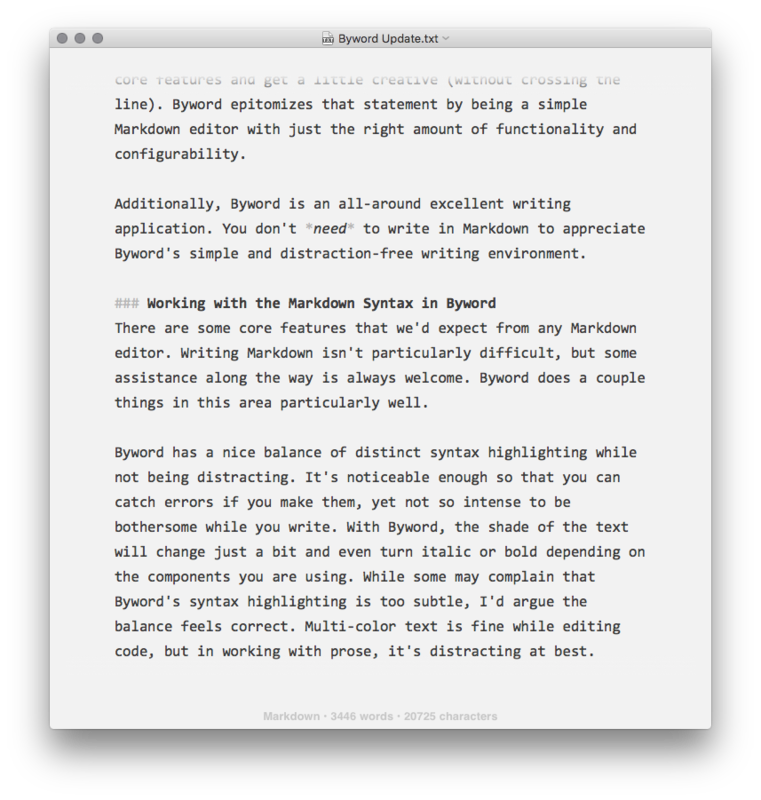 Byword is our favorite Markdown editor for Mac OS X. It’s a wonderfully simple, delightfully useful editor that had us itching to continue writing. At a certain point, all Markdown editors start to feel pretty similar to one another and, in reality, many of them are. The general functionality is pretty straightforward and these applications tend to reflect that. To stand out in this crowded category, an app needs to nail the core features and get a little creative (without crossing the line). 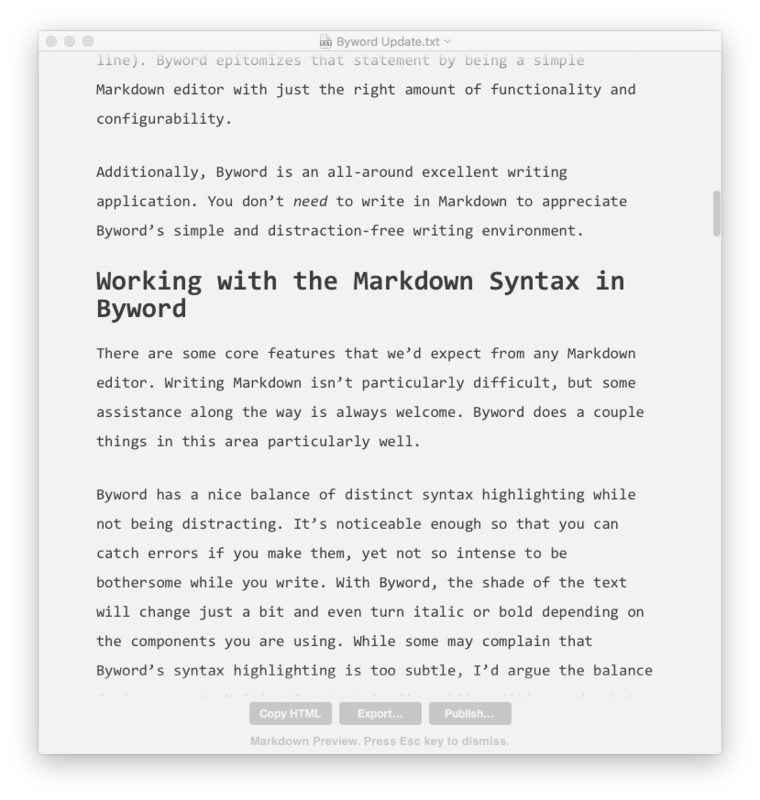 Byword epitomizes that statement by being a simple Markdown editor with just the right amount of functionality and configurability. Additionally, Byword is an all-around excellent writing application. You don’t need to write in Markdown to appreciate Byword’s simple and distraction-free writing environment. There are some core features that we’d expect from any Markdown editor. Writing Markdown isn’t particularly difficult, but some assistance along the way is always welcome. Byword does a couple things in this area particularly well. Byword has a nice balance of distinct syntax highlighting while not being distracting. It’s noticeable enough so that you can catch errors if you make them, yet not so intense to be bothersome while you write. With Byword, the shade of the text will change just a bit and even turn italic or bold depending on the components you are using. While some may complain that Byword’s syntax highlighting is too subtle, I’d argue the balance feels correct. Multi-color text is fine while editing code, but in working with prose, it’s distracting at best. Byword’s syntax auto-completion is as smart as any Markdown editor I’ve used. For example, if I start an unordered list, complete one item, and press Return, Byword knows the next piece of content should be in the list and begins another list item for me. Likewise, highlighting a string of text and using standard shortcuts for bolding (CMD + B) or italicizing (CMD + I) text puts the correct syntax in place automatically. So, in a lot of situations you can remember common keyboard shortcuts instead of Markdown syntax. Inserting a link is simplified in Byword as well. A Markdown link requires two parts: the text to be linked is contained within square brackets and the actual URL within parenthesis. Not too difficult, but I forget where to use brackets versus parenthesis with this one all the time. The keyboard shortcut CMD + K will drop in an empty link (()) ready for you to complete, or you can highlight any text, type CMD + K, and Byword will wrap that text with the proper link syntax that is ready for the URL. It’s essentially like pasting in a quick snippet. It can both save you time as well as help you learn the correct syntax for many of the most common Markdown artifacts. Even with some nice syntax highlighting, I do still wonder how my Markdown documents will look when rendered. I like to double-check my document and sometimes find it easier to read and review in a rendered format. Byword has a quick preview option that does exactly what you’d think it does. Using either a keyboard shortcut or selecting the correct item from the menu, you’ll see your Markdown quickly rendered. Pressing Option + CMD + P or selecting Preview Markdown from the File menu will quickly display the rendered Markdown. Pressing Escape will dismiss the preview. It is extremely easy and quick to flip back and forth. From the preview you’ll see shortcuts to Copy HTML, Publish (we’ll talk about this in just a bit), and Export. Export options can also be reached via the File menu. Not all editors offer the breadth of export options that Byword does, so no matter what your situation is, my guess is that there is an export that fits your needs. Options include: HTML, PDF, RTF, and the slightly more obscure LaTeX. And believe it or not, you can even export your beautiful Markdown as a Word document. I’m not sure when exactly that comes in handy, but it’s there should you ever need it. Byword will let you publish your writing from Byword straight to Medium, WordPress, Tumblr, Blogger, and even Evernote. For those that regularly publish to any of those services, this could be an incredibly useful feature. People that do a fair amount of writing on the web will often do their writing in an external application (i.e. Byword) and then copy and paste that text into whatever service they’re using (i.e. WordPress). This publish feature allows you to cut out one step. Your process can live in one place — the place where you’re writing. Once you’ve configured a service, a Publish option will be available from the File menu as well as from the Markdown preview. Confirm your post title, add any available metadata (such as tags, categories, etc. ), and you’re done. Byword certainly fits in the category of “distraction-free writing application” as well as any Markdown editor. Writing is difficult enough in its own right. We love applications that ease that pain (even if just a little) and help us to become more efficient writers. Byword’s lack of clutter makes it a terrific writing tool. Many of the applications we tested felt overwhelming considering the task at hand. Providing the functionality that users need in an unobtrusive way is something Byword does exceptionally well. Features and functionality are there, but they can easily be hidden, allowing you to focus completely on your writing. There isn’t an overwhelming number of features and customization options in Byword — in fact, the lack of customization helps you, the writer, focus on the words instead of fiddling with settings that don’t really matter. You can change the font the editor uses, the column width (narrow, medium, or large), and the color theme (dark or light), but that’s basically it. That may not seem like enough flexibility, but I found those options to fit my needs quite nicely. It feels as though Byword allows for the right amount of configuration options in the right places. I don’t know about you, but the less time I spend tinkering around with the application the better. Here’s where Byword has a couple of those delightful features that can have serious impact on your writing. Taking the distraction-free idea a step further, Byword allows you to put focus on either the paragraph you’re writing or even the line you’re writing. Here’s how it works: based on your settings, only the line or paragraph you’re writing will display in the prominent color (black text on white background or white on black background) and the rest of the text dims. You can still read it, but your focus is now clearly on the specific line you’re writing. I was a little skeptical of this feature at first, but I found myself really, really enjoying it. It’s amazing how helpful that subtle level of focus can be. I’ve also come to rely on the paragraph-level focus when editing my writing. When you scroll through a document, you’re automatically kicked out of the focus mode, but as soon as you start to move your cursor through the text paragraphs (or lines), the focus takes over again. This allows you to focus your editing to one paragraph while still having some context for the surroundings. Another seemingly simple feature is typewriter mode. There’s really not a lot to this one. Essentially, by turning on typewriter mode your cursor will stay vertically centered on the page. As you type each line, the page slides up one line rather than the cursor moving down the page as you type — the cursor stays on the same line. When you’re using a real typewriter, the ribbon and striking keys stay in the same place because that’s how they’re built. When a line is complete, the piece of paper slides upward and you continue typing in the exact same place, only one line lower on the paper. Again, I originally thought this was not all that useful, but it’s another feature to which I’ve become quite attached. Byword is a phenomenal writing application for the Mac, but we should also mention its ability to sync to its companion iOS applications as well. This a very handy feature especially since we also consider the iOS version of Byword to be our favorite iPhone Markdown editor. Syncing is seamless and can happen through either iCloud or Dropbox. You can even use both sync methods since you’re able to navigate your connected sync services from your iOS devices. The syncing is very straightforward. Create a document on any of your connected devices, and it’s available on all of your devices. You can work on your documents wherever you’d like and, when saved, the changes will be reflected across the board. Moreover, since Byword’s documents are simply text files, syncing your writing in a Dropbox folder allows easy access to your writing from any Mac, Windows, or iOS applications that also have access to Dropbox. An excellent solution if you prefer Byword on the Mac and, say, Editorial on the iPad. Byword for Mac is currently priced at $11.99, which puts it approximately in the center of the price range for this application category. As has been mentioned more than once in this article, we’d like to reiterate there are a lot of choices in this category. We’re confident Byword is the best, but based on your specific tastes, we’d like to mention a few more solid options that were in the group of candidates for this review. iaWriter and WriteRoom aren’t drastically different from Byword, but lack some of the features we love so much. Both of these applications bill themselves as minimalist, distraction-free writing applications (and they certainly are). In our opinion, they go a bit too far in that direction and are less flexible for more general purpose writing. Another solid general-purpose Markdown editor choice is Markdown Pro. This is an application that has some great features and generally gets the job done, but it looks and feels a bit dated. Where iaWriter and WriteRoom feel too minimal, Markdown Pro feels too cluttered and lacks the focus and clean design you’ll find in Byword. There isn’t an abundance of pro-level Markdown editors, but there are definitely a pair of exceptional ones. Our favorite editor in this category (moving beyond a pure Markdown editor) is Ulysses. Ulysses can be used as a basic Markdown editor — in fact, it has that look — but underneath the hood is a crazy amount of functionality geared toward the writer. Ulysses is an editor that adds more features to our idea of what a Markdown editor is and those features are focused on writers. It’s a very beautiful editor and actually has many of the qualities we love from Byword, but it goes further by adding things like writing statistics and goal setting along with more organizational features and version history. Ulysses is a really lovely application, but it just goes way beyond what we deem as a Markdown editor. That said, if you’re a writer looking for something a bit more than what Byword has to offer, Ulysses this is an excellent choice. If you’re interested in a more robust writer’s companion, then I’d highly recommend giving Ulysses a try. At $45, it’s the most expensive application we’ve mentioned in this article, but that’s a bargain considering the amount of functionality packed within. Writer Pro is a process focused editor. 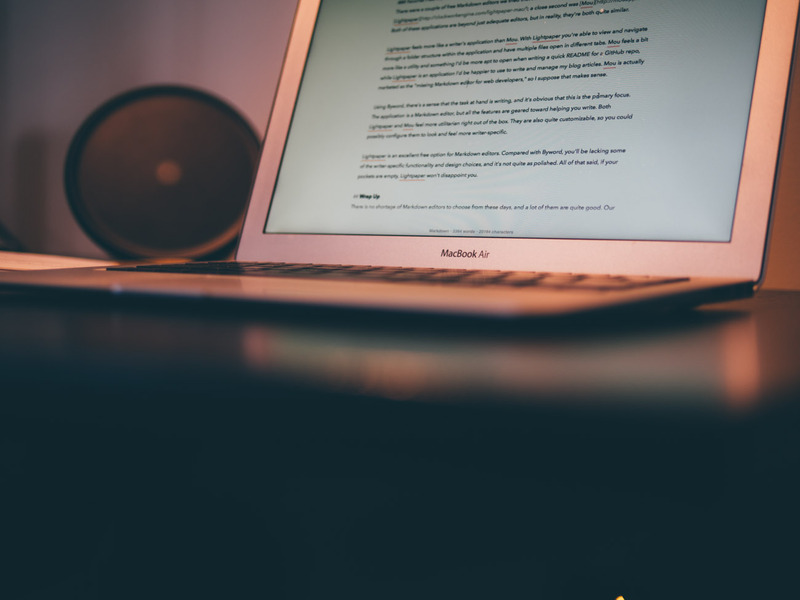 While it does have the basic Markdown editor features the most prominent feature is how it guides you through a writing and editing workflow. You start a document as a Note then move it through the Write, Edit, and Read parts of the workflow. While this is a very interesting approach and potentially great for some people, but it is opinionated in its workflow so at the same time it isn’t an application for everyone. 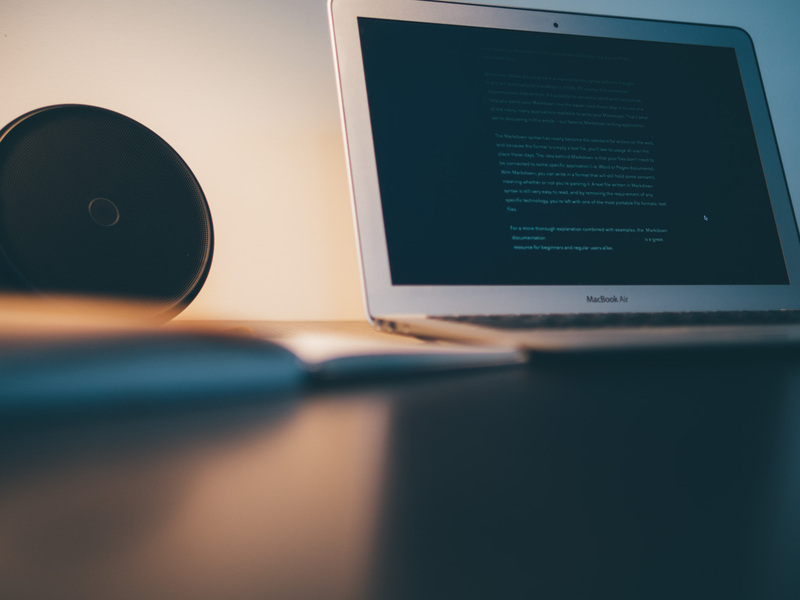 If it melds with your writing workflow it’s certainly worth a look. FoldingText is a Markdown editor and then some. Markdown is the accepted syntax, but some handy features are layered on top to add some really interesting functionality and amazing flexibility. It bills itself as a text editor with productivity features, and this sums it up nicely. The basic Markdown editing features are there, but it’s also possible to do things like create todo lists and parse natural language (“in 3 hours”). Think of writing up a schedule with specific times for specific events, similar to Fantastical. Oh, and we should also mention the folding thing (as in Folding Text). Keyboard shortcuts allow you to collapse (fold) and display parts of your document as you see fit. The application is also extensible, so developers have thought of all sorts of creative ways to expand its functionality even further. It does a bit more than our criteria for a straight Markdown editor, but it is certainly worth checking out if you’re looking for that type of flexibility. There were a couple of other Markdown editors we tried that stand out in our minds, and our favorite was Lightpaper; a close second was Mou. Both of these applications are beyond just adequate editors, but in reality, they’re both quite similar. Lightpaper feels more like a writer’s application than Mou. With Lightpaper you’re able to view and navigate through a folder structure within the application and have multiple files open in different tabs. Mou feels a bit more like a utility and something I’d be more apt to open when writing a quick README for a GitHub repo, while Lightpaper is an application I’d be happier to use to write and manage my blog articles. Mou is actually marketed as the “missing Markdown editor for web developers,” so I suppose that makes sense. Using Byword, there’s a sense that the task at hand is writing, and it’s obvious that this is the primary focus. The application is a Markdown editor, but all the features are geared toward helping you write. Both Lightpaper and Mou feel more utilitarian right out of the box. 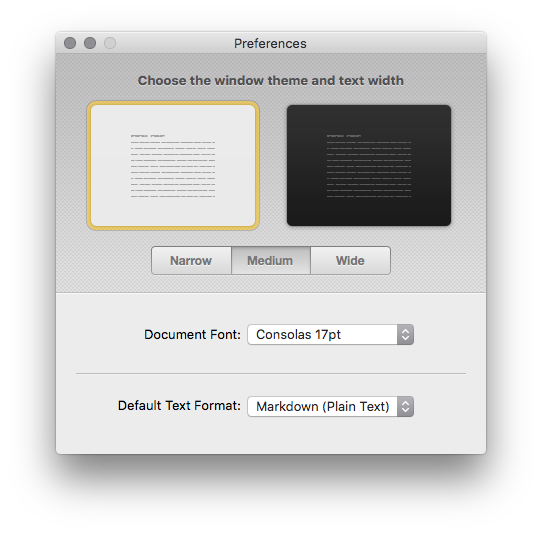 They are also quite customizable, so you could possibly configure them to look and feel more writer-specific. There is no shortage of Markdown editors to choose from these days, and a lot of them are quite good. Our focus was to find the best Markdown editor that (a) helps you write in the proper syntax; (b) makes it easy to export or publish your written words out of Markdown and in to other formats; and (c) generally makes writing easier and more enjoyable. Byword hits the sweet spot. 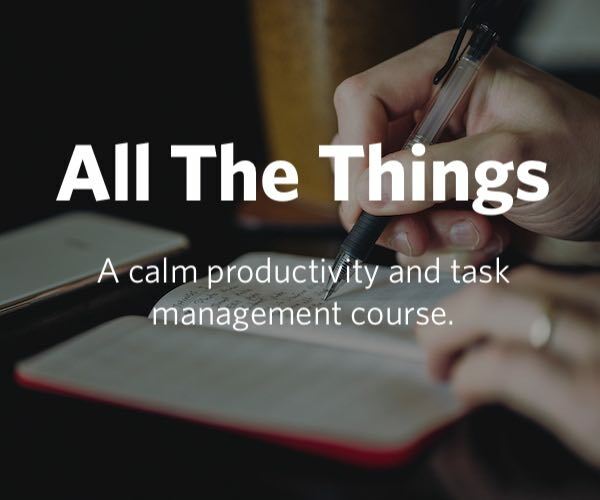 It’s not overbearing or distracting, yet there’s enough there to make you happy and more productive — and there’s just enough configuration options to allow for some personalization. On top of this, you’ll find an extremely well thought-out application with a layer of polish that is hard to find elsewhere. In short, if you want to write using Markdown, get Byword. 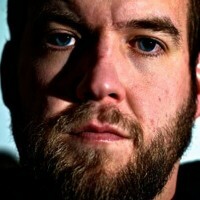 Matt is a designer and writer living in Chicago, Illinois where he pushes pixels at Table XI and writes for The Industry, a site that focuses on startups and people in the design industry.